Hereford Mennonite Church, Bally, Pennsylvania. Butter Valley Community Church (formerly Hereford Mennonite Church) (Alliance of Mennonite Evangelical Churches), located at Bally, Berks County, Pennsylvania, originally named for the township in which it is located, dates back before 1725. Originally the area was within the Manatawny, then Colebrookdale, then Hereford, now the borough of Bally in Washington Township. The first ministers of the "Manatant" congregation were Jacob Bechtel and David Longenecker. The first resident ministers (1728) were George Bechtel and Peter Noll. After the division of 1847 there were two congregations, the smaller group, now known as Bally Mennonite, adhering to the Franconia Conference, the other incorporated since 1893 as Hereford Mennonite Church, a member of the Eastern District Conference. In 1955 the membership was 282, and the pastor was Henry G. Grimm. 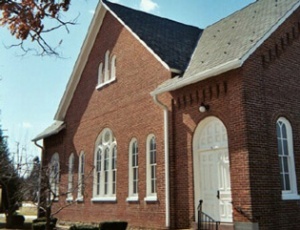 In 2001, at the time of the creation of Mennonite Church USA from the merger of the Mennonite Church and the General Conference Mennonite Church, Hereford withdrew from the Eastern District to become part of the new Alliance of Mennonite Evangelical Churches (AMEC), which formally chartered in 2002. Originally known as Hereford Mennonite Church, it changed its name to Butter Valley Community Church some time after joining the AMEC. Johnson, Elmer E. S. and Sam Steiner. "Butter Valley Community Church (Bally, Pennsylvania, USA)." Global Anabaptist Mennonite Encyclopedia Online. August 2010. Web. 20 Apr 2019. http://gameo.org/index.php?title=Butter_Valley_Community_Church_(Bally,_Pennsylvania,_USA)&oldid=140612. Johnson, Elmer E. S. and Sam Steiner. (August 2010). Butter Valley Community Church (Bally, Pennsylvania, USA). Global Anabaptist Mennonite Encyclopedia Online. Retrieved 20 April 2019, from http://gameo.org/index.php?title=Butter_Valley_Community_Church_(Bally,_Pennsylvania,_USA)&oldid=140612. Adapted by permission of Herald Press, Harrisonburg, Virginia, from Mennonite Encyclopedia, Vol. 2, p. 709. All rights reserved.